This vacuum is a powerful, lightweight, easy-to-use machine that steers around and under furniture with minimal effort. 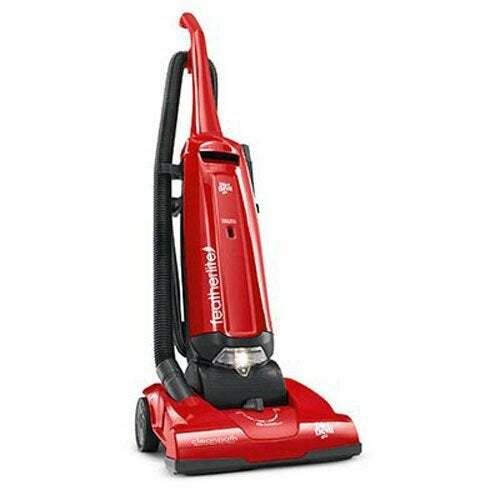 Its power mixed with its great maneuverability and pet cleaning tools make it the best Dirt Devil upright vacuum. It features a Spin4Pro premium pet brush roll that effectively cleans and removes pet hair on carpet and hard floors. It also has a TurboClaw pet tool that removes hair on stairs and upholstery. What’s more: it has an odor-trapping filter that reduces and minimizes pet odors. It’s been found to tip over when standing upright. This is the best Dirt Devil upright vacuum for quick pick-ups and light, daily cleaning. It weighs less than 9 pounds and includes a retractable handle. A unique Scuff Guard traps debris on hard surfaces without scratching delicate finishes. Automatic height adjustment makes it the perfect choice for homes with carpets and hard floors. The length of the stretch hose is really short and the cleaning path is a bit narrow. Powerful cyclonic technology allows this Dirt Devil to tackle big messes. This machine is great for allergy sufferers. Small and compact, this vacuum has a lightweight design that makes it easy to maneuver around the house. It also has great storage for accessory tools, allowing you to vacuum in tight spaces with ease. The dust canister is small, so you’ll have to empty it out more frequently. A 13-inch-wide cleaning path covers more surface in a shorter time, providing you with a more efficient clean. MicroFresh filtration traps more than 99% of dust and allergens. This vacuum comes with 5 height adjustments, allowing you to adjust settings based on the type of floor you’re vacuuming. The attachment hose has been found to pop out of its holster during vacuuming. Power, meet convenience. This is one of the best Dirt Devil upright vacuums because of its powerful suction and Vac+Dust Hard Floor tool that picks up heavy dirt and debris. 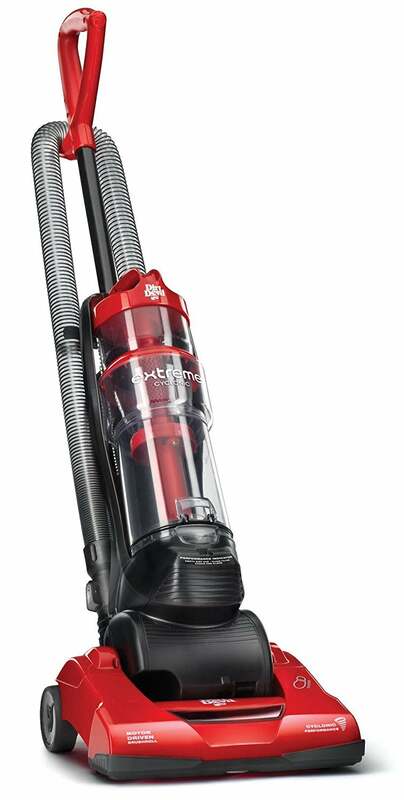 With Direct Path Cleaning Technology, this vacuum can capture dirt from edge to edge. The on-demand cleaning wand instantly switches to above-floor cleaning to put the whole room within reach. It’s slightly louder than some of the other Dirt Devil upright vacuums we reviewed and the cord can get wrapped in the wheels when vacuuming. Dirt Devil upright vacuums pack a powerful punch. Not only do they have excellent suction power that gets rid of most dirt and debris, but they also come with a variety of cleaning tools and attachments that make vacuuming a breeze. Some important features included with these uprights are odor-trapping filters, indicator lights, and precise maneuverability. The House Method team tested some of these products in our Research Lab and conducted extensive research on a variety of models to provide you with the pros and cons of the best Dirt Devil upright vacuums. Keep your floors spotless with one of these top five Bissell stick vacuums. Our House Method Reviews team bought and tested the best Bissell sticks on the market to provide you with unbiased information that will help you make a smart purchase.